In our exam classes, students learn specific steps, routines and combinations in preparation for exams in August/September each year. In ballet and modern theatre jazz we follow the ISTD syllabus; while our hip-hop, tap and contemporary classes follow the NZAMD syllabus. We pride ourselves on a high and consistent pass rate. Ballet is the foundation of most forms of dance and the skills it teaches translate into other styles students may be learning. It is a disciplined genre that is perfect for developing strength, control, balance, posture and flexibility. The qualities gained from learning ballet include focus, discipline, confidence and dedication – all of which can have a positive impact on schoolwork and other areas of life. At Northern School of Performing Arts, ballet classes follow the ISTD syllabus, which has evolved to promote the English classical style. Our ballet teachers are highly experienced, passionate and dedicated, so you can be assured that your child is good hands. While they are not compulsory, we encourage students to sit the annual ISTD exams. Students also have the opportunity to showcase their hard work at our annual end-of-year performance. Modern Theatre Jazz is a rhythmic dance style that originated in America before spreading to the rest of the world. It is often seen on the stages of musical productions and is known for its theatrical qualities. The style uses travelling steps, high kicks, leaps and turns, which all require strength and flexibility. This is a highly energetic dance style and one of the most enjoyable for students of all ages. NSPA follows the ISTD syllabus for modern jazz, with students encouraged to sit the exams, which we work towards throughout the year. Term 4 is dedicated to learning the class dances for our end-of-year production. Popular around the world, tap dance is a theatrical art form often seen on stage in musicals. Tap evolved as an American dance form, influenced by African dance, Irish dance and/or clog dancing. At NSPA, our tap classes work towards the NZAMD syllabus, and students are invited to sit exams at their teacher’s discretion. 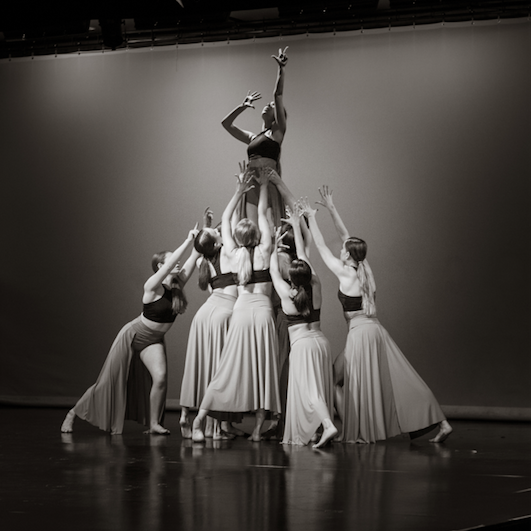 As with the other dance styles, our tap students perform at the end-of-year production. Hip-hop includes a wide range of techniques, including breaking, locking, and popping, which developed in the 1970s and were made popular by dance crews in the United States. Hip-hop is ideal for those who love a relaxed environment where you can express yourself freely and move with the beat. NSPA offers both open and exam hip-hop classes. The exam classes work through the NZAMD syllabus, with exams usually taking place in Term 3. Contemporary is a genre of performance dance that employs compositional philosophy, rather than choreography, to guide unchoreographed movement. It uses techniques and methods found in ballet, modern dance and post-modern dance, and draws from other philosophies of movement beyond the realm of classical dance technique. Partner work and floor work are key focuses of contemporary dance, making it great for developing upper body strength. NSPA contemporary classes follow the NZAMD syllabus. Contemporary dance is an advanced style. Please contact us to find out more about you/your child's suitability. Stretch classes are an ideal way to improve the flexibility and strength required for all dance genres. NSPA offers competition work for our elite dancers, as well as troupe work, extension classes and acrobatics training. Entry to troupes is by audition or invitation only and is a year-long commitment to rehearsals and frequent weekend competitions. Enquire about Dance classes today!